In the two months since her fall from the City, Xhea has hidden in skyscraper Edren, sheltered and attempting to heal. But soon even she must face the troubling truth that she might never walk again. Shai, ever faithful, has stayed by her sidebut the ghost’s very presence has sent untold fortunes into Edren’s coffers and dangerously unbalanced the Lower City’s political balance. War is brewing. Beyond Edren’s walls, the other skyscrapers have heard tell of the Radiant ghost and the power she holds; rumors, too, speak of the girl who sees ghosts who might be the key to controlling that power. Soon, assassins stalk the skyscrapers’ darkened corridors while armies gather in the streets. But Shai’s magic is not the only prizenor the only power that could change everything. At last, Xhea begins to learn of her strange dark magic, and why even whispers of its presence are enough to make the Lower City elite tremble in fear. Together, Xhea and Shai may have the power to stop a waror become a weapon great enough to bring the City to its knees. That is, if the magic doesn't destroy them first. Karina Sumner-Smith is a Canadian author of fantasy, science fiction, and young adult. She is the author of Radiant: Towers Trilogy Book One. Her short fiction has appeared in The Living Dead 2, The Best Horror of the Year Volume Three, and Children of Magic, among others. Among being reprinted in a number of anthologies, her short stories have also been nominated for the Nebula Award and have been translated into Czech and Spanish. She lives in Toronto, Ontario. "Impossible to put down! Sumner-Smith has outdone herself in this thrilling sequel with higher stakes, darker magic, and a bond of friendship that proves unbreakable--even in the face of war. Readers will be desperate for the conclusion!" 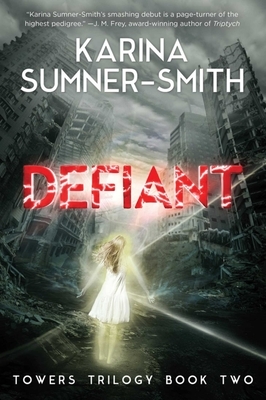 "In this inventive second Towers Trilogy fantasy (following Radiant), Sumner-Smith delves deeper into the dark, destructive magic that is making protagonist Xhea's life a living hell ... New readers will struggle to catch up, but returning fans will appreciate that Sumner-Smith has done a fine job of setting up the final good vs. evil, rich vs. poor magical showdown." "Defiant is a compelling novel of character. Once I picked it up, I couldn't put it down again, to such a degree that I walked to the train station still reading. ... Tight, tense, and effortlessly readable, its climax is a thing of nail-biting intensity, and it ends with revelations, and more change to come. I can recommend it wholeheartedly--and I'm really looking forward to reading book three."